Download "Fayette County Public Schools Policy # 123013"
3 Return to Work/ Work Incentive Benefit Rehabilitation and Return to Work Assistance Worksite Modification and locating counseling resources. Unum supports efforts that enable a disabled employee to remain on the job or return to work as soon as possible. If you are disabled but working part time with monthly disability earnings of 20% or more of your indexed monthly earnings, during the first 12 months, the monthly benefit will not be reduced by any earnings until the gross disability payment plus your disability earnings, exceeds 100% of your indexed monthly earnings. The monthly benefit will then be reduced by that amount. Unum has a vocational Rehabilitation and Return to Work Assistance program available to assist you in returning to work. We will make the final determination of your eligibility for participation in the program, and will provide you with a written Rehabilitation and Return to Work Assistance plan developed specifically for you. This program may include, but is not limited to the following benefits: coordination with your Employer to assist your return to work; adaptive equipment or job accommodations to allow you to work; vocational evaluation to determine how your disability may impact your employment options; job placement services; resume preparation; job seeking skills training; or education and retraining expenses for a new occupation. 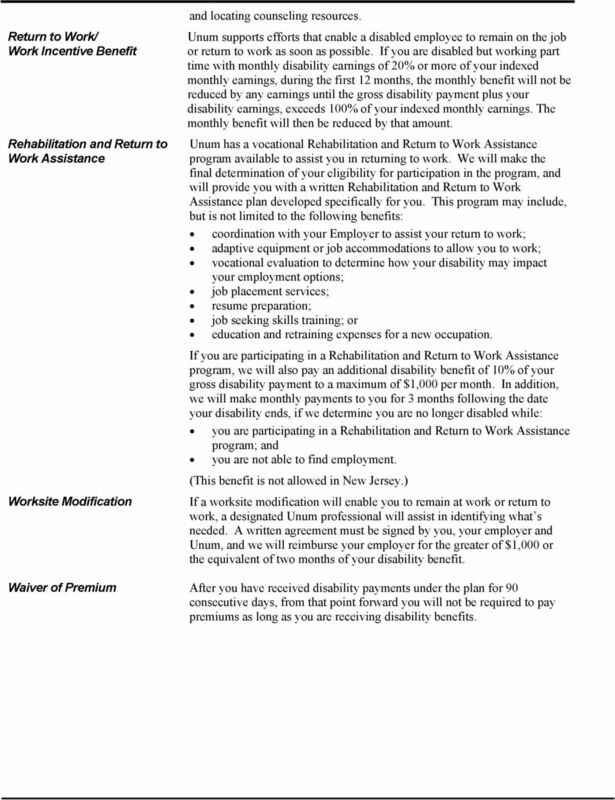 If you are participating in a Rehabilitation and Return to Work Assistance program, we will also pay an additional disability benefit of 10% of your gross disability payment to a maximum of $1,000 per month. In addition, we will make monthly payments to you for 3 months following the date your disability ends, if we determine you are no longer disabled while: you are participating in a Rehabilitation and Return to Work Assistance program; and you are not able to find employment. (This benefit is not allowed in New Jersey.) If a worksite modification will enable you to remain at work or return to work, a designated Unum professional will assist in identifying what s needed. A written agreement must be signed by you, your employer and Unum, and we will reimburse your employer for the greater of $1,000 or the equivalent of two months of your disability benefit. Waiver of Premium After you have received disability payments under the plan for 90 consecutive days, from that point forward you will not be required to pay premiums as long as you are receiving disability benefits. 5 Definition of Disability the payments will be the lesser of the benefit payable under the terms of the prior plan or the benefit under the Unum plan; the elimination period will be the shorter of the elimination period under the prior plan or the elimination period under the Unum plan; and benefits will end on the earlier of the end of the maximum period of payment under the Unum plan or the date benefits would have ended under the prior plan. You are disabled when Unum determines that: you are limited from performing the material and substantial duties of your regular occupation due to your sickness or injury; you have a 20% or more loss in indexed monthly earnings due to the same sickness or injury; and during the elimination period you are unable to perform any of the material and substantial duties of your regular occupation. After benefits have been paid for 24 months, you are disabled when Unum determines that due to the same sickness or injury, you are unable to perform the duties of any gainful occupation for which you are reasonably fitted by education, training or experience. You must be under the regular care of a physician in order to be considered disabled. Gainful Occupation Benefit Integration Gainful occupation means an occupation that is or can be expected to provide you with an income within 12 months of your return to work, that exceeds 80% of your indexed monthly earnings if you are working or 60% of your indexed monthly earnings if you are not working. Your disability benefit will be reduced by deductible sources of income and any earnings you have while disabled. 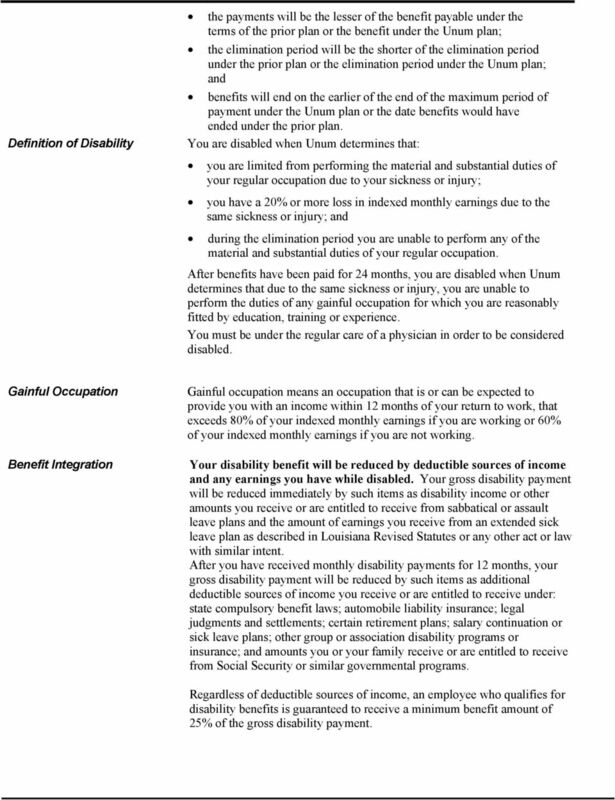 Your gross disability payment will be reduced immediately by such items as disability income or other amounts you receive or are entitled to receive from sabbatical or assault leave plans and the amount of earnings you receive from an extended sick leave plan as described in Louisiana Revised Statutes or any other act or law with similar intent. After you have received monthly disability payments for 12 months, your gross disability payment will be reduced by such items as additional deductible sources of income you receive or are entitled to receive under: state compulsory benefit laws; automobile liability insurance; legal judgments and settlements; certain retirement plans; salary continuation or sick leave plans; other group or association disability programs or insurance; and amounts you or your family receive or are entitled to receive from Social Security or similar governmental programs. 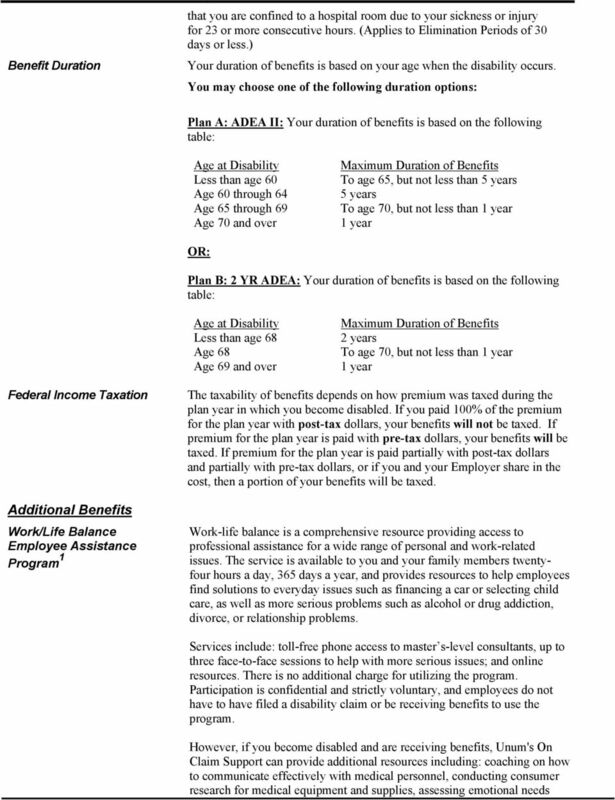 Regardless of deductible sources of income, an employee who qualifies for disability benefits is guaranteed to receive a minimum benefit amount of 25% of the gross disability payment. 6 Mental Illness/Self-Reported Symptoms The lifetime cumulative maximum benefit period for all disabilities due to mental illness and disabilities based primarily on self-reported symptoms is 24 months. Only 24 months of benefits will be paid for any combination of such disabilities even if the disabilities are not continuous and/or are not related. Payments would continue beyond 24 months only if you are confined to a hospital or institution as a result of the disability. 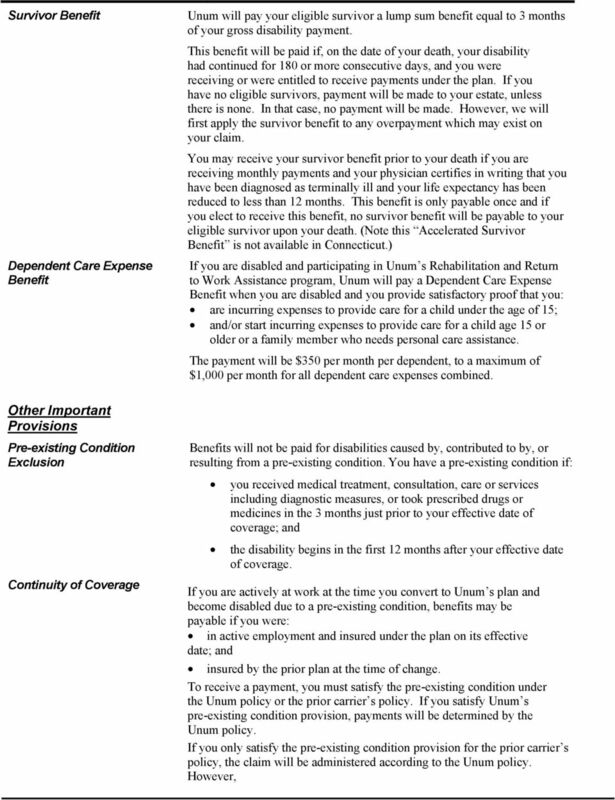 Instances When Benefits Would Not Be Paid Benefits will not be paid for disabilities caused by, contributed to by, or resulting from: intentionally self-inflicted injuries; active participation in a riot; commission of a crime for which you have been convicted; loss of professional license, occupational license or certification; pre-existing conditions (see definition). an occupational injury or sickness (this will not apply to a partner or sole proprietor who cannot be covered by law under Workers' Compensation or any similar law); Termination of Coverage Unum will not cover a disability due to war, declared or undeclared, or any act of war. Unum will not pay a benefit for any period of disability during which you are incarcerated. 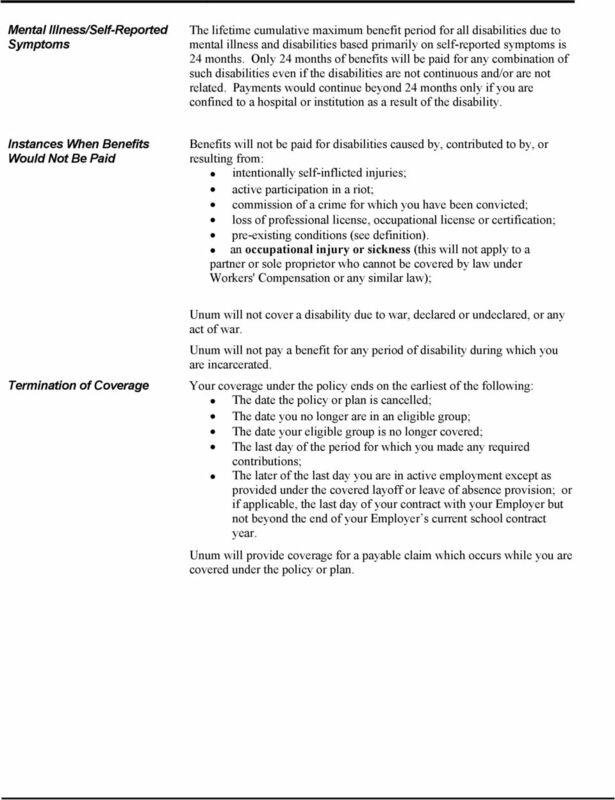 Your coverage under the policy ends on the earliest of the following: The date the policy or plan is cancelled; The date you no longer are in an eligible group; The date your eligible group is no longer covered; The last day of the period for which you made any required contributions; The later of the last day you are in active employment except as provided under the covered layoff or leave of absence provision; or if applicable, the last day of your contract with your Employer but not beyond the end of your Employer s current school contract year. Unum will provide coverage for a payable claim which occurs while you are covered under the policy or plan. 7 Next Steps How to Apply/ Effective Date of Coverage Delayed Effective Date of Coverage Questions To apply for coverage, complete your enrollment form within 60 days of your eligibility date. Please see your Plan Administrator for your effective date. If you do not enroll during the initial enrollment period, you may apply only during an annual enrollment. If you are absent from work due to injury, sickness, temporary layoff or leave of absence, your coverage will not take effect until you return to active employment. Please contact your Plan Administrator after you return to active employment for when your coverage will begin. If you should have any questions about your coverage or how to enroll, please contact your Plan Administrator. 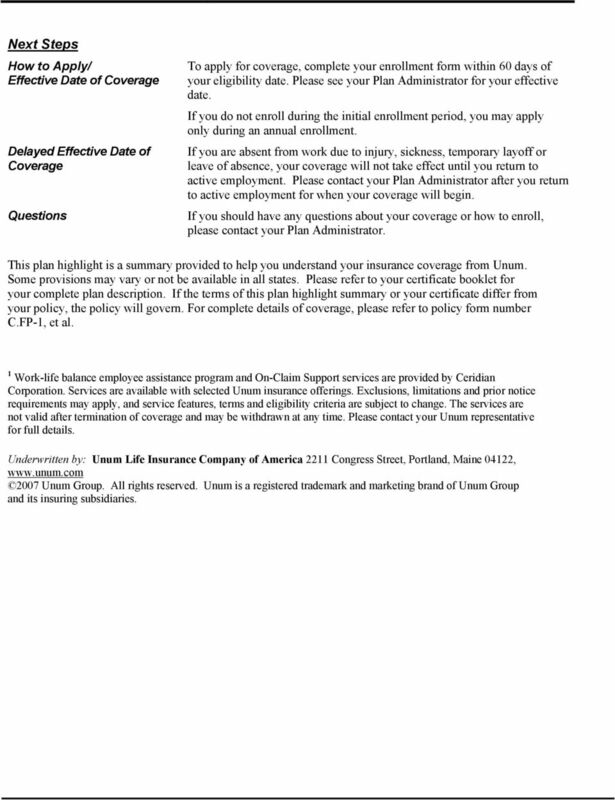 This plan highlight is a summary provided to help you understand your insurance coverage from Unum. Some provisions may vary or not be available in all states. Please refer to your certificate booklet for your complete plan description. 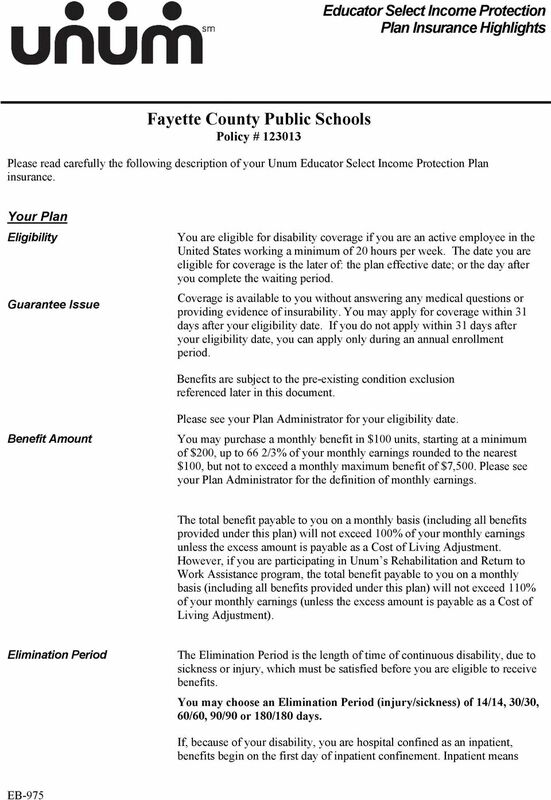 If the terms of this plan highlight summary or your certificate differ from your policy, the policy will govern. For complete details of coverage, please refer to policy form number C.FP-1, et al. 1 Work-life balance employee assistance program and On-Claim Support services are provided by Ceridian Corporation. Services are available with selected Unum insurance offerings. Exclusions, limitations and prior notice requirements may apply, and service features, terms and eligibility criteria are subject to change. The services are not valid after termination of coverage and may be withdrawn at any time. Please contact your Unum representative for full details. Underwritten by: Unum Life Insurance Company of America 2211 Congress Street, Portland, Maine 04122, Unum Group. All rights reserved. Unum is a registered trademark and marketing brand of Unum Group and its insuring subsidiaries. Short Term Disability Insurance Employee funded Are you prepared for an unexpected disability? Unum s Short Term Disability Insurance helps pay the bills when you can t work Savings aren t always enough. American Fidelity Assurance Company s Long-Term Disability Income Insurance Plan Designed Specifically For: Oklahoma State University Why Do You Need Disability Income Protection? No One Plans To Be Disabled.